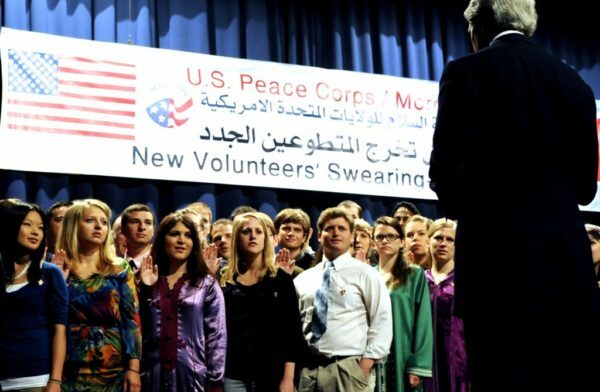 106 New U.S. Peace Corps Volunteers to Serve in Morocco. The U.S. Peace Corps will welcome 106 new volunteers to its Morocco division, according to a communiqué released by the U.S. Embassy in Rabat. A ceremony is expected to be held on Friday, December 9 at the Transatlantic Hotel in Meknes where volunteers will be sworn into two years of service in Morocco. The ceremony will be attended by U.S. Ambassador to Morocco Dwight Bush as well as Steve Driehaus, the former Ohio Congressman who now leads the Peace Corps in Morocco. Peace Corps volunteers have also been known to work with a number of important organizations such as Dar El Chabab, Nadi Neswi and Dar Taliba, among others. American-Moroccan Program to Teach Drâa-Tafilalet Region Students English. The regional council of Drâa-Tafilalet issued a communique last Sunday, announcing an agreement with American institution, Midwest American Development Enterprise. The agreement aims to teach English to the students of Drâa-Tafilalet. With the slogan of “Drâa-Tafilalet speaks English by 2030,” the project budget estimates MAD 60 million, in which Drâa-Tafilalet will allocate 51% of its budget to this project. The region’s council said: this project follows “Morocco’s policy to foster receptivity towards foreign languages and Anglo-Saxon culture […] English is the language of economy, science, industry, tourism and international relations. The source asserted that “the program will include 64 beneficiaries annually, who will receive an [accredited] and qualified certificate.” The same source added that approximately 180 linguisticoffices will be constructed on the campuses of the institutions and associations. This project will also create approximately 450 job opportunities for the youth of the region, especially those with a BA in English studies, who will be trained under the supervision of distinguished American professors. The regional council of Drâa-Tafilalet is planning to launch exchange programs for the region’s students in partnership with states of Michigan and South Carolina in order to enhance their language and cultural knowledge. HCP: 87 Percent of Moroccans Oppose Gender Equality Inheritance. Eight-seven percent of Moroccans oppose gender equality in the division of inheritance, according to the results of a national survey on the United Nations sustainable development goals for the year 2030. The High Commission for Planning’s (HCP) report showed that 70 percent of Moroccan families attribute the inequity between men and women in society to traditional values and patriarchal behaviors, with forty-one percent of citizens saying equality between men and women is a reality in Morocco. The study, carried out between July 1st and August 19th of this year, included the opinions of 14,000 citizens over the age of 18, across 12 regions in order to help the government “understand citizens’ evaluation of dimensions of human development in their daily lives,” the HCP said. The U.N. started a new push to implement its 17 development goals for the next 14 years at the top of 2016. The goals include ensuring every human being has access to a good education, a healthy natural environment and a peaceful and just society. The survey’s results show that 80 percent of Moroccans believe the kingdom can achieve all of the U.N.’s goals by 2030, while 50 percent of respondents said they had taken steps to improve their interactions with the environment in the past five years. Morocco has led the charge in global anti-climate change efforts, as demonstrated in 22nd Convention of the Parties (COP) held in Marrakesh last month. The kingdom is on track to source 52 percent of its energy needs from renewable energy sources by 2030. Organization Demands Clarification on Number of Amazigh Speakers in Morocco. The National Federation of Amazigh Associations directed a message of protest to the High Planning Commission for not reporting the number of Amazigh-speaking Moroccans in its census results, according to a new report by Qushq. The group cited a number of “reservations” regarding the results of the December 2014 census, which does not include information on the number of Amazighi speakers in the kingdom, despite the inclusion of checkboxes regarding the matter on the census forms. In a statement to Qushq, the organization questioned the benefit of collecting information on the prevalence of the Amazigh language if the Moroccan people will not get to see the real results. The HCP’s final results included a previous figure for the portion of Moroccans who speak Amazighi based on a sample size of two percent of the population, which was followed with a “non-exclusive” indicator in parenthesis. “What does the commission want the Moroccan people to understand from this mystery?” the association said, adding that the words in the parenthesis had “no meaning” and that surveying two percent of the population could not lead to the same information gleaned from a national census. The group added that the HCP has allocated MAD 864.7 million for Amazighi education projects based on the statistic from the two-percent sample, but no government leader or civil service group has asked for clarification on the figure until now. Amazigh became an official language of Morocco, alongside French and Arabic, after the adoption of the post-Arab Spring 2011 constitution, which guaranteed the original inhabitants of the region full cultural and political rights in the kingdom. HCP: 43.6 Percent of Moroccans Perceive Extreme Poverty to be Prevalent. 43.6 percent of Moroccans have stated that extreme poverty is present in their environment, according to a national study carried out by the High Commission of Planning (HCP). The HCP carried out the study on poverty and social inequality between July 1 and August 19 of this year, surveying more than 14,000 people over the age of 18 across 12 Moroccan regions. 43.6 percent of Moroccans, based on the research, have admitted that extreme poverty exists in the environment around them. 39.8 percent of those living in extreme poverty are living in urban areas and 49.9 percent of those in rural areas. When studying the root of the problem, the HCP found that most think unemployment is the leading cause of poverty, while many others think the precariousness of employment and social inequality also play important roles in causing poverty. The study also mentions how only 47.6 percent of people know about public programs attempting to counter poverty in Morocco, while 65.5 percent believe those suffering from poverty don’t benefit much from these programs while 23.5 percent believe the poor don’t benefit at all from these programs. An interesting component of the study also surveyed citizens on how they perceived the evolution of social inequality over the last ten years. A staggering 63.5 percent of those surveyed thought social inequality rose: As for what solutions people have in hopes of reducing social inequality, over 55 percent believe that improving the quality of jobs and valuing wages and unemployment benefits would be the key to overcoming this gap. The study also looked at the value of food waste generally every month (in U.S. dollars) and found that Morocco 45.9 percent of food that is wasted costs less than $5, 42.6 percent costs between $6 and $20 while, understandably, the pricier food items were less likely to be wasted. Interestingly enough, the study also found that attitudes changed depending on the time of the year. During Ramadan, for example, 84.8 percent of people declared that food waste is higher in Algeria, Egypt, Lebanon, Morocco, Tunisia and Turkey “due to the high quantity of food purchased and prepared but never eaten. In an effort to reduce food waste, Morocco launched a food waste reduction strategy in June 2015, in partnership with the FAO, that aims to reduce food waste by 50 percent by 2024. Ever since I was a young girl, maps fascinated me. My father had gifted me a globe on my 7th birthday. I would look at it for hours, and lose myself in the glories of exploration. “We are here ma’am” said Ibrahim, our driver, a stout man with sharp features approaching his mid-40s. And there we were. I wouldn’t have believed it myself, that here I was, parked outside a small village in Morocco. It had been a long time since then; now twenty-two, yet the explorer in me smiled a hearty smile as I exited the vehicle. Bhalil, a small village tucked away beside the distant mountains, stood calm and tranquil. To the unaccustomed eye it was just an ordinary village that reeked with poverty. “Is this it? ?” I asked myself. “It couldn’t be” replied the voice inside. Ibrahim led the way. I followed him on a narrow and deserted street, a dead, calming silence had taken over me. The sun stood distinct in the sky. The street ended, leading us right into the village. I stood momentarily and peered across the uphill on which the village rested. I was mesmerized by the eye-catching houses that were painted in pastel shades of pink, yellow and blue. It was a spectacular wave of colour and life that stood on the dusty, barren land. I could hear soft gales of laughter from the children playing with stones on the side. We ascended uphill on the dusty broken roads. The sun smiled at us. I wanted to capture every detail of this alluring town that even blinking felt like a loss of precious time. I’d been in Morocco for four days, and visited beautiful places but this struck me as something authentic, away from the tourist facades that occupied the most popular parts of the country, this was real. Cool air blew our way, stronger the more climbed up. On left hand side ran the remains of what seemed to be a canal, neglected by the mountains which once used to provide it with fresh streams of water, now stood there dry and dead. We carried on until we reached an uneven platform, with two women sitting beneath the shade of a lonely olive tree outside a broken door, its paint decaying as it struggled to hold firm its handle which was half falling off. The women were carefully forging some strings together. ‘Ah they must be making the buttons’ I thought to myself. Prior to our arrival I was reading about the women of Bhalil, who are known for creating the traditional jelleba buttons. Each versatile string forged together using a complex technique, I know I certainly wouldn’t be able to master, yet the end result; a subtle ball of extraordinary detail, used as buttons for Morocco’s traditional attire. ‘Wait wait’ signalled Ibrahim as he approached a petite old woman stood at the door of what seemed to be a residence of some sort. Her warm smile was surrounded by loose folds of skin; she wore a black head scarf tied in a knot under her chin, and a faded yellow maxi accompanied by a chequered apron around her waist. After a brief conversation with her, Ibrahim insisted that we come in “please come please.” We were welcomed in by the very endearing old lady, Naima. The interior of the house was something I’d not quite ever seen; the walls had a stalagmite texture and formed an uneven arch above our heads, the ceiling lazily painted with a sharp shade of yellow. “We are standing inside a natural cave house” said Ibrahim, snapping me out of my fascination into a whole new realm of curiosity. He went on to explain that the village of Bhalil is notable for its unique cave houses located in the old part of the village. We sat down on the assorted sofas aligned across the edges of the cave, my eyes couldn’t help but wander around every corner, when I realised that the sink had no tap, Ibrahim explained to me the cave houses have no access to water inside so they have to go outside to the local water source to get the water every day. Its only when you sit amongst those less fortunate than you that you realise that things you take for granted are actually blessings. Naima didn’t speak much, but her hospitality spoke for itself, she prepared fresh Moroccan tea and walked slowly towards us with the tray in her delicate hands, she glanced up at us with a brief toothless smile she softly said ‘Marhabba’ (Welcome). She placed the tray on the crooked table in front of us which was scattered with photographs and letters. It seemed like Naima was used to having visitors from all around the world. Her late Mother Um Aicha was frequently visited by tourists, who sat with her and took photographs, it soon become a tradition that whenever someone would visit the cave they take a photograph and later post it to Naima with a letter. Her mother was 90 when she passed away two years ago explained Naima, her family had been cave dwellers for over 300 years, generation after generation living in this very cave. Ibrahim pours the tea into a cup, if you’ve ever had tea in Morocco, you will most likely notice two things: the tea is poured from very high up and an extra glass is also poured. I watched him carefully, wondering if I’d ever be able to master the art of Moroccan tea pouring, most likely not! We sipped on the fresh mint tea, the very smell of it reanimates the spirit, Naima sat quietly for a moment then pointed at the tea and with her limited English, she jokingly said “Moroccan whisky” she giggled to herself; it was hard not to join in. I sat next to Naima and asked for a photograph; every time she smiled her eyes would squint a little, just like mine did. Ibrahim burst into laughter every time he attempted to take the photograph. “what’s so funny Ibrahim” I asked “You and Naima same same” said Ibrahim, he’d obviously seen some sort of resemblance, he showed me and Naima the picture and she smiled, she held my hand and said “ abnatay”, Ibrahim told me that it meant “my daughter” my heart melted, I felt overwhelmed that someone I’d just met could treat me with utmost respect and love, it was beautiful. Notes from Abroad: Rabat, Morocco. In the 30 seconds preceding the call to prayer at the mosque across the street from my host family’s apartment in Rabat, Morocco, I can hear the faint prayers from other mosques in surrounding neighborhoods. The prayer begins based on the position of the sun in relation to the location of the mosque. It comes in a wave, like a canon-style song, one mosque starting just moments before the other. I can detect the sounds of three or four distinct mosques before the prayer comes pouring through my window from the mosque closest to me. I enjoy when the voice of the muezzin (the man who leads the prayer) cracks, a reminder that this is not a recording. On my first or second night in my family’s apartment, I woke in a panic to the prayer that began around 5 a.m. The panic did not subside as I sat wide-eyed in bed listening to the prayer finish. In those following moments, I knew there was another side to my fear that I could not fully attribute to being suddenly awoken, a fear I would reencounter frequently in my first weeks: internalized Islamophobia. In the days, weeks and now months following, I returned to that moment in attempts to investigate the panic I felt. The only context in which I had heard the prayer before was in sound bites for media about terrorism — whether in news segments or films — with broad, sweeping shots of the desert and bearded men. I apologize. I do not aim to recreate these depictions. I do not aim to justify my fear. But I do aim to identify, locate and question where my perceptions stem from. There were other moments in the first month where I found myself, foolishly, combating the same sense of panic I had in my bed on that first morning. I know that much of the fear came from navigating a new culture with a limited grasp of the language. As I discovered Rabat, I just barely knew what to do when things went right and was clueless when things went wrong. Still, I cannot overlook the insidious nature of Islamophobia in Western media and how it shaped my expectations for studying in a Muslim country. The call to prayer still wakes me every morning. I rise and use the restroom. Creeping down the hallway, I listen to the feathery voice of my host mother, praying in the living room adjacent to the bathroom. I meditate on her spiritual reverence and deep compassion. Whenever there is a sick person or a death on the news, she will start whispering a prayer with a furrowed brow, her fingers pressed to her lips. Often she tells me she has prayed for my family, specifically for my sister who has been sick this semester. I lie back in bed, wide-eyed, panicked about returning to the states in two weeks and confronting current dialogues about Islam and the Middle East. As someone who was interested in the region, language and culture, I had to live in a Muslim nation to unlearn much of what Western media gets wrong. I do not know how I will begin to communicate my experiences to an audience that does not wish to listen. “People in America, they misunderstand my country, my people,” says the young man who has stopped me in the city to practice his English. “Yes, they do,” I say. The Moroccan city of Marrakech is committed to green tourism. A leading global tourist destination and Morocco’s top attraction, the city has recently hosted the COP22 climate change summit and is fast turning into a green city that encourages eco tourism. Tourism is the second highest source of income, making up 12% of Moroccan GDP – more than 10 million tourists visited the country in 2015. The National Tourism Office is keen to integrate environmental awareness and protection initiatives into the tourism sector. More than 72 Moroccan hotels, hostels and smaller accommodations have now been awarded the prestigious Green Key for their environmental efforts and responsibility, of which 30 can be found in Marrakech. The Green Key is a voluntary eco label supported by the United National Environmental Programme (UNEP) and the World Tourism Organisation (UNWTO). At present, 2,500 establishments across 53 countries are accredited. These efforts form part of Morocco’s new policy to encourage sustainable development in order to achieve its Vision 2020 Tourism Strategy. This strategy is designed to make the country’s tourism industry more competitive, aiming to attract 20 million tourists by 2020. While Marrakech is a cosmopolitan city, modest dress is always appreciated in order to be respectful of local customs, particularly in the Medina. Some tourists go around in skimpy t-shirts and shorts or miniskirts, which can create unwanted attention. As a Muslim country, most local women do not show skin apart from face and hands. Do at least have something to hand to cover up your shoulders and keep our knees covered. Similarly, overt public displays of affection between couples should be avoided, as should eating and drinking while walking along the street, and smoking in the street during Ramadan. The account that follows details the expulsion of Spanish Jewry and its immediate consequences. It was written in Hebrew by an Italian Jew in April or May, 1495. "About their number there is no agreement, but, after many inquiries, I found that the most generally accepted estimate is 50,000 families, or, as others say, 53,000- [This would be about 250,000 persons. Other estimates run from 100,000 to 800,000.] They had houses, fields, vineyards, and cattle, and most of them were artisans. At that time there existed many [Talmudic] academies in Spain, and at the head of the greatest of them were Rabbi Isaac Aboab in Guadalajara [probably the greatest Spanish rabbi of his day], Rabbi Isaac Veçudó in Leon, and Rabbi Jacob Habib in Salamanca [later author of a famous collection of the non-legal parts of the Talmud, the En Yaakob]. In the last named city there was a great expert in mathematics, and whenever there was any doubt on mathematical questions in the Christian academy of that city they referred them to him. His name was Abraham Zacuto." The Edict was enacted on the false ground that the Catholic monarchies, that ordered the Jews to live in assigned areas in their kingdom, to allow them to continue living in peace and harmony with the Christians, have deliberately breached this agreement and proceeded by proselytism to convert Christians to their faith: You know well or ought to know, that whereas we have been informed that in these our kingdoms there were some wicked Christians who Judaized and apostatized from our holy Catholic faith, the great cause of which was interaction between the Jews and these Christians, in the cortes which we held in the city of Toledo in the past year of one thousand, four hundred and eighty, we ordered the separation of the said Jews in all the cities, towns and villages of our kingdoms and lordships and [commanded] that they be given Jewish quarters and separated places where they should live, hoping that by their separation the situation would remedy itself. Furthermore, we procured and gave orders that inquisition should be made in our aforementioned kingships and lordships, which as you know has for twelve years been made and is being made, and by many guilty persons have been discovered, as is very well known, and accordingly we are informed by the inquisitors and by other devout persons, ecclesiastical and secular, that great injury has resulted and still results, since the Christians have engaged in and continue to engage in social interaction and communication they have had means and ways they can to subvert and to steal faithful Christians from our holy Catholic faith and to separate them from it, and to draw them to themselves and subvert them to their own wicked belief and conviction. and in the light of this false assertion, the Catholics decided to expel them to protect their faith, but the truth of the matter is that like all Europeans up to the Third Reich, they were jealous of their intellect and their success in business : Therefore, we, with the counsel and advice of prelates, great noblemen of our kingdoms, and other persons of learning and wisdom of our Council, having taken deliberation about this matter, resolve to order the said Jews and Jewesses of our kingdoms to depart and never to return or come back to them or to any of them. And concerning this we command this our charter to be given, by which we order all Jews and Jewesses of whatever age they may be, who live, reside, and exist in our said kingdoms and lordships, as much those who are natives as those who are not, who by whatever manner or whatever cause have come to live and reside therein, that by the end of the month of July next of the present year, they depart from all of these our said realms and lordships, along with their sons and daughters, menservants and maidservants, Jewish familiars, those who are great as well as the lesser folk, of whatever age they may be, and they shall not dare to return to those places, nor to reside in them, nor to live in any part of them, neither temporarily on the way to somewhere else nor in any other manner, under pain that if they do not perform and comply with this command and should be found in our said kingdom and lordships and should in any manner live in them, they incur the penalty of death and the confiscation of all their possessions by our Chamber of Finance, incurring these penalties by the act itself, without further trial, sentence, or declaration. Heralded as a 'third way' amid the uprisings and crackdowns of the Arab Spring, Morocco introduced a new constitution and other reforms. Morocco, held up as a model for reform in the wake of the Arab Spring, is slipping back into autocracy. Though a new constitution was passed in 2011, ongoing economic marginalization, a lack of transparency, and abuses by security forces have driven citizens to the streets for the first time in five years. Observers and rights activists say that the government has responded by stifling speech and press freedoms and using the long reach of its security services to prevent a new protest movement from gaining steam. They have concluded that for Arab autocracies, it's not enough to change the laws on paper without reforming the institutions which enact those laws – institutions that remain unaccountable, lacking in transparency, and used to enforce the monarch's will. “Morocco is frequently held up as a success, that the government did the right thing. A new constitution is huge, but it is a constitution on paper. The reforms are only as good as they are implemented,” says Sarah Yerkes, a Morocco expert and visiting fellow at the Brookings Institution in Washington. When the Arab Spring protests shook Morocco in 2011, instead of using force to crack down on dissent, as in Syria or Bahrain, or allowing a toppling of the government as in Egypt, the country's monarchy chose a third way: implementing immediate democratic and constitutional reforms to quell growing anger in the streets. King Mohammed VI implemented a liberal constitution empowering the parliament and prime minister, and surrendering a handful of his own powers – including the ability to dissolve the parliament. The constitution was overwhelmingly approved, with reportedly 98 percent of voters in favor, and elections were held later that year – allowing the opposition Islamist Justice and Development Party (PJD) to sweep into government. While the liberal reforms were hailed in the region and by some Western observers as a wise response to popular dissent, evidence indicates that five years later the democratic reforms have had little impact. Unemployment still stands around 10 percent, while youth unemployment is double that at 20 percent – reaching as high as 39 percent in urban areas. Since the reforms, freedom of speech has been stifled. The Moroccan state prohibits the use of encrypted communications such Skype, Facebook Messenger, and WhatsApp voice calls on the grounds of protecting telecommunications companies from unfair competition. The Moroccan state has had a series of high-profile arrests of journalists and human rights activists. In June, the judiciary began a trial of seven leading human rights activists for training citizen journalists through a mobile phone app. It was in this atmosphere of eroding freedoms and distrust with the state that protests erupted in October after fish wholesaler Mouhcine Fikri was crushed to death in a truck during an attempt to retrieve over $11,000 worth of swordfish confiscated by authorities. The protests exposed Morocco’s much-praised reforms as largely a façade, and only changed the way the state operated on the surface, observers say. In order for true reform in autocracies and monarchies to take hold, experts and advocates say there needs to be a reform of the deep state – the judiciary, security services, and other government agencies, to prevent the palace from using them to enforce its will. Without the reform of the state itself, experts say regimes such as Morocco can easily undermine their own democratic reforms and allow for extensive patronage networks and corruption that maintains support for the monarchy while limiting economic opportunities for its citizens. The Moroccan state has stayed one step ahead of citizens calling for deeper reforms by co-opting major organized political forces, making them invested partners in the makhzen. By allowing the PJD to form the government and win successive elections, the Moroccan regime has ensured that the Islamists – the largest organized political group in the country – would continue to be partners with the state and unwilling to challenge the status quo. So when protests broke out in Al Hoceima over the fishmonger’s death, the PJD issued a statement to its followers urging them “not to respond in any way to any protest.” Leftist and national groups, disorganized and divided over their role in post-2011 Morocco, were also largely no-shows. The Moroccan regime has even enlisted the support of salafists, clerics, and other Islamic figures – allowing them a free space to preach, as long as they advocate continued support for the monarch and denounce those looking to change the balance of power in the country. This has left activists and protesters without an organization or body to push the regime for institutional reform. While the reform has succeeded in keeping the pressure for full reform at bay in the near-term, observers say it is not a long-term formula for stability for Morocco – or any other Arab state looking to take a page from its playbook. Since the first dawn of modern societies, education has been considered to be among the strongest pillars upon which advancement and productivity are based. Education, indeed, is a means through which knowledge can be conveyed and preserved from one generation to another. However, when the process of transmitting knowledge into the upcoming generations is ill-formed, education, hence, becomes « A system of imposed ignorance » as Noam Chomsky has said. It is, de facto, undeniable that Morocco has begotten a myriad of intellectuals in various fields, some of whom are known worldwide. Yet, the irony lies, with very few exceptions, in these intellectuals’ being unsatisfied with Morocco’s educational system. A good example is Mahdi Elmandjra, who was an outstanding, yet marginalized figure that had studied up to his baccalaureate in Morocco, Rabat. He, indeed, had never been satisfied with the educational system of his beloved country, and had critisized it in many an occasion. Hence, the question emerges, what is wrong with our educational system? If it is to be put under scrutiny, our educational system has many gaps. Over time, these gaps have been trivialized by the people ; yet, if not noticed and worked upon to be filled, appreciable progress cannot be achieved. The first and, to be frank, fiercest issue that our educational system has, is teaching the student to be satisfied with giving supremacy to unsupported claims over evident theories. To demystify, pupils study in « The scientific Activity Book » or what could be transliterated as « Anachat Al Ilmi » of the sixth grade of primary school the lesson of Archaic Humans. This lesson aims at showing the pupil the history of our kind and how we have developed into what we are today. In other words, that lesson aims at teaching the pupil, whose mind cannot fathom complex ideas yet, the concept of human evolution, by elucidating the aspects that underlie the emergence of anatomically modern humans. This lesson is a conspectus used as a preface to Darwnian Evolution, which is to be studied later on, and which apparently clashes with the religious beliefs of many a person, as well as with what is contained in « Islamic Education Book ». At this stage, it is the responsibility of the teacher to enlighten the path of these pupils through helping them acquire a critical sense of thinking that can enable them to adopt what has the strongest evidence. Yet, this does not happen in most cases. Having a frail sense of critical thinking, the Moroccan sudent is easily persuaded to believe in what is pseudoscientific and has no strong evidence whatsoever, instead of searching, critisizing and discovering the truth, though there are exceptions. A good example of this is medical students, whom I highly respect, in our universities who believe in creationism, though their whole study is based upon Darwinian Evolution. In addition to what has been mentioned above, the method using which pupils are being taught also proves to be deficient. Even in scientific school subjects, the pupil is put to getting used to internalizing information, and giving it back to the teacher on the day of the exam to get a good grade. This leads to being a passive learner that can only be injected with information, and who is totally incapable of searching for information, or of creating new ideas. In other words, pupils become a sort of programmed robots that are in no way going to do but what they have been programmed to do, which leads to the death of creativity. As children, people are born with an insatiable desire to know, but this desire is altered in schools into an insatiable desire to graduate and get a job. Our educational system fails in seeding the student with the idea of learning for the sake of knowing, and prevails, on the other hand, in seeding the idea of learning for the sake of having a decent job. As a result, many a Moroccan student specializes in what they abhor for the sake of a bright future, which hinders them from reaping the fruits of a whole academic career, and which deduces the whole academic career in a sum of money that they begin to receive as they start to work. On average, Moroccans read 27 books a year, spending 57 hours consuming knowledge from a variety of subject areas, according to a new study conducted in the United Arab Emirates. Morocco’s results tie it for second place in the 2016 Arab Reading Index, which included all 22 members of the Arab League in its region-wide survey, published on Tuesday. The researchers from the Mohammed Bin Rashed Al Maktoum Foundation circulated an electronic questionnaire online, with support from Arab celebrities, who shared the survey to their web followings on Facebook and Twitter. Of the 148,294 residents of the Arab World who responded, 60,680 were students completing various stages of their education, 87,614 others came from different professional and social backgrounds. Egyptians logged 63.85 hours of reading time annually – highest number of hours of all Arab countries included in the United Nations Development Programme sponsored study. The country’s residents completed 27 books a year – just like Moroccans. Lebanese respondents said they read for 59 hours a year, completing 29 books in the process – the highest number of all countries surveyed. Somali respondents reported the weakest reading habits, with citizens diving into a book for just 7.78 hours every year. Moroccan readers also said they diversified their reading, allocating equal amounts of time to texts related to their profession and books chosen out of sheer interest. Of all Arab nations, Morocco demonstrated the lowest difference in time spent reading books inside and outside their field of work – with most of the brain-building activity occurring in Arabic. A study published by the United Nations Development Program (UNDP) has revealed that religion is an important factor of daily life for most young Moroccans. The 2016 Arab Human Development Report, released on November 29, surveyed Moroccans between the ages of 15 and 24 and found that more than 90 percent of young Moroccans claim religion plays an important role in their daily life. Though data for 2014 and 2015 was not made available by the study, the table below shows that in 2012, 99 percent of young Moroccans said that religion played an important role. In 2013, 96 percent said the same. In 2013 North Africa, more young Moroccans claimed religion played an important role than the young people surveyed in Kuwait (80 percent) or Tunisia (89 percent). The study, which gathered data from the Middle East and North African region, as well as some Sub-Saharan countries, revealed an overall unanimous opinion that religion was important in daily life. But what does this mean for politics and government? “The mantle of religion,” says the UN study, “can be attractive to politicians. Political parties that use religious interpretation to support their platforms and political agendas are common in the region.” This would at least partially explain Morocco’s Party of Justice and Development’s success, as the October election win marked the Islamist political party’s second victory. The study also surveyed countries on their views of Da’esh. In Morocco, more than 80 percent purported to have a negative view. A little less than 10 percent had a positive view, and a little less than 10 percent were neutral. While Morocco’s stats proved similar to that of Algeria and Egypt, an astonishing 20 percent in Mauritania claimed to have a positive opinion of Da’esh. Overall, the study gives interesting information on the MENA youth perspective, giving us important insight on what the future may hold. With winter’s grip tightening around North America’s throat, we’re already looking forward to the longer days and warmer temperatures of springtime. What better way to embrace the fertile season than an extended spring break in the desert? How about riding around Morocco to catch sections of a desert rally while enjoying epic roads, mountains, dunes, medinas, souks and kasbahs along the way? Yes, please. Next March 14-27, Edelweiss Bike Travel will lead a motorcycle tour that follows Tuareg Rallye as it winds its way through Morocco. The description of the tour is enticing, but they set the hook with the photos. Here’s a brief rundown: The tour kicks off in Almería, Spain, and begins with a ferry ride across the Mediterranean Sea to Morocco. Ride through the Rif Mountains to the imperial city Fes, where you can enjoy a cup of mint tea in a café amid the bustling activity of the medina. “These are dangerous times throughout the world, ”Ayouch was quoted by Variety as saying. “We have seen this with the election of Donald Trump in the U.S. and the rise of the far right in Hungary, Austria and France. Demagogy is leading in a new way, and there’s a new form of cultural hegemony – we’re seeing similar trends in the Arab world.” “Razzia” is set in Ouarzazate, the Atlas Mountains and Casablanca. It is composed of five separate stories, one of which dates back to the 1980s in the Atlas Mountains. The remaining four storylines take place in present day Casablanca. In an attempt to shed light on the role of women in Moroccan society and her social status, “Razzia” portrays the modern Moroccan woman as she is, “oppressed” in the quest for her freedom. It’s also a condemnation of continuing social norms that do not allow her to choose her own lifestyle. Therefore, “the woman will move to start a new life far from her husband,” Ayouch said. “The education system turned its back on the humanities. This happened throughout the Maghreb region. In Morocco, disciplines such as sociology and philosophy were taken off the curriculum. We are now suffering the consequences. We’re building a new kind of human being,” he added. The Moroccan actress Najat Benssalem, who was ridiculed for her casual dress at this 16th Marrakech International Film Festival (MIFF), is a real life heroine who rose from obscurity to stardom before getting quickly trapped again. The story of Najat Benssalem, known as Rajaa Bent El Mellah, is a truly fascinating one, of an artist who quickly entered the world of fame thanks to a breakout movie role, screened at the MIFF in 2003. Right after her first performance, for which she was given the Best Actress Award during the same edition, she quickly realized that the world she entered could break her as quickly as it made her a star. Years later, after Rajaa lost the public’s attention, it came back as quickly and unexpectedly as it had faded, celebrating her as a real-life heroine. Surely, this story will mark the 16th session of MIFF and inspire people for years to come. For Rajaa, who was marginalized in Morocco for thirteen years, standing on the red carpet brought her back to the limelight, but in the most inconsiderate way imaginable. In 2003, the former actress was the first Arab and African woman to receive the Marcello Mastroianni Award at the Venice Film Festival. She was recognized as an emerging actor for her role in the film “Rajaa,” directed by Jacques Doillon and starring Pascal Greggory. Soon after, she was offered to stay in France and continue her career as a professional actress, but she refused to leave Morocco. For the next thirteen years, she would regret this decision, especially after the dire financial situation she suffered, which led to her selling vegetables, fish and cigarettes at a local market. The dress she appeared in at Marrakech Film Festival displayed her suffering, as it was less than casual. The red caftan and black leggings she wore were seen as “unbecoming” and heavily criticized on social media. The actress gave interviews following the mockery, where she bitterly stated her deep sorrow at the way people reacted to her clothing. In an interview with the Arabic-language news source Qushq, Rajaa said that what hurt her even more were “the calls [she] received from Moroccan actors, who considered [her] appearance marring their image and the image of their city,” adding that the black leggings that were labeled as “inappropriate” were medical leggings she began wearing after breaking her leg. The Moroccan actress explained that this was the first time since 2003 that she was invited as a main participant in the Marrakech festival. She added that she previously participated in the festival in a small capacity and was not allowed to walk the red carpet. This comeback was made possible thanks to film director Abdelilah Jaouhari, “without whom I would not have a place to live or something to eat,” she said. The wave of sympathy on social media following Rajaa’s account of her story was much larger than the wave of mockery. The controversy reached a local radio station and its deputy director, Bahiya Benkhar Essoukrati, invited “Rajaa” to a radio program, where she planned a surprise for her. Essoukrati had the prominent fashion designer Sofia El Harabichi to dress Rajaa up for a second red carpet pose at the festival. This time, Rajaa’s appearance could not be criticized. Even when public attention slipped from under her feet, Rajaa continued to play the role of the heroine. For thirteen years straight, she kept fighting poverty by doing all sorts of jobs that most Moroccans disapprove of. When she finally got the chance to walk the red carpet with the hope that the people may remember her, she fell prey to their propensity to poke fun at anything they judge as “inappropriate,” by standards that ignore people’s sufferings. Getting people to rethink this attitude is the work of a real life artist. “Tonight, I’ll be on the red carpet. At 5 A.M, I have to be in the retail market to buy vegetables that I’ll sell, and by the end of the day, I’ll go to Jamaa El Fna to sell cigarettes. I always dream of the red carpet, but I stay realistic,” she told Moroccan Moroccan journalist Khouloud Sajid.